"Thank you above all for loving [our son] and appreciating him as his own unique person. We are so proud of who he has become!" 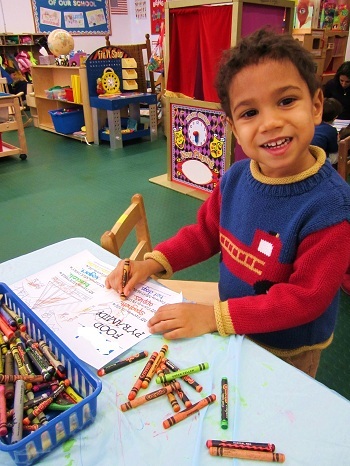 “Letter O is for Occupations” Week is Next! 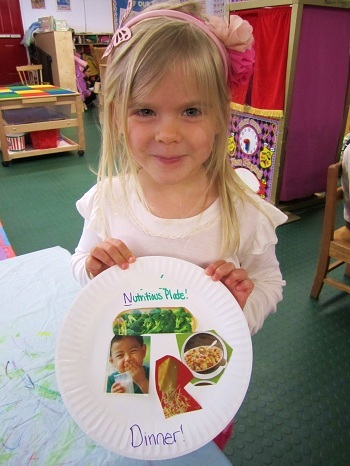 Letter N is for Nutrition Week was Neat, Nice, Nifty and “g-Narly”. 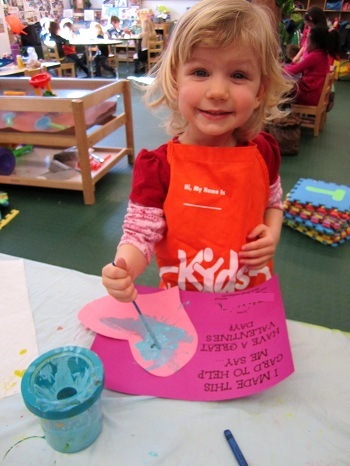 Read on below to learn about all the fun and learning that took place! Monday began with the students’ shares. Some of the highlights include Narwhals, Nests, Noodles, Necklaces, Nets, Nutcrackers, Necktie and a map of New Jersey! The students threw the teachers through a loop when an orange was pulled out of share box. Thinking the child was a week early for Letter O Week, the teacher suggested that the orange should come back to school next week. The student quickly corrected the teacher by saying that he brought in a Naranja – which is the word for orange in Spanish! One student even brought in a Nutritious Letter N snack for all to share – Nectarines! The nectarines were distributed and definitely enjoyed by all! Later in the week, another student brought in piNeapples for all his classmates to share! What great shares came in during N week! 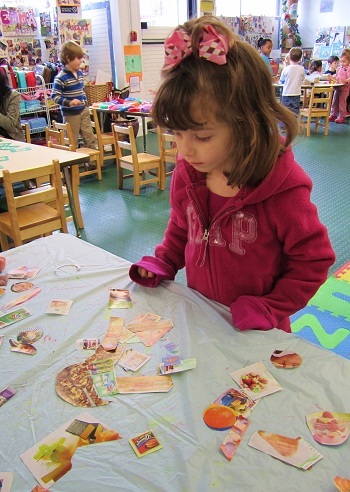 On Monday and Tuesday, the students worked on their letter N activities throughout their stations. 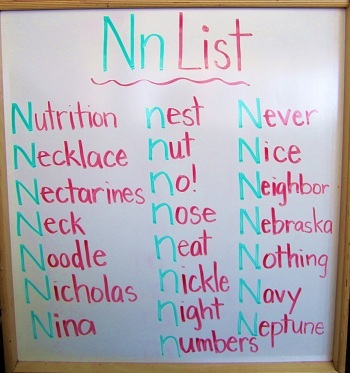 During the afternoon, the students brainstormed a list of letter N words. Here is one of the lists they came up with! Wednesday was a very exciting day at PPA! 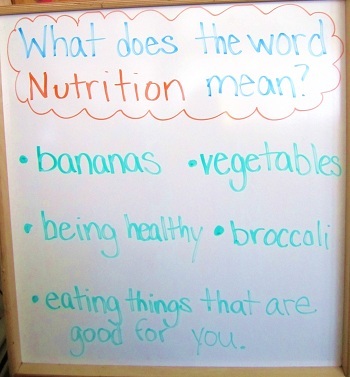 The students discussed what they thought the word “Nutritious” means. Here is what they came up with. After settling in on the idea that nutritious meant “eating good food”, the students raised their hands to answer the next question: “What foods are good?” A little confused by the question, the students began listing foods that “tasted good” but did not necessarily fall under the umbrella of nutritious. After a little redirection, the words ice cream and cake were changed to more nutritious foods like broccoli and strawberries. 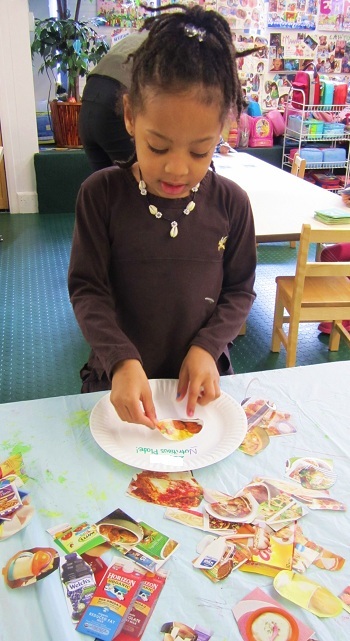 After the discussion, the students learned all about the Food Pyramid and why it is important (and yummy!) to select food from different food groups. 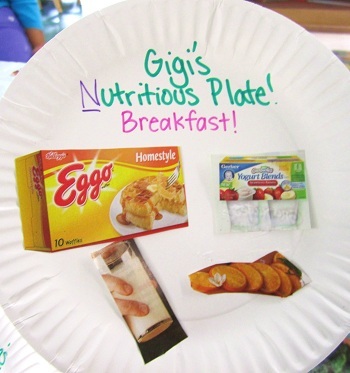 To help practice this, the students were called up and asked to sift through images of various foods cut out from magazines. First, the students identified which meal they would like to pick out a Nutritious meal for – breakfast, lunch, or dinner. 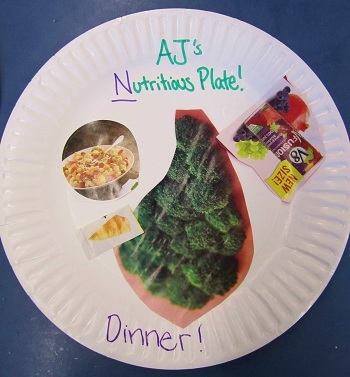 Once the meal time was selected, the students sifted through the images to create a well-balanced, multi-food group, and most importantly, YUMMY meal! Here are some of the meals that the students came up with. During Wednesday (and Thursday) afternoon, the students had an opportunity to come up and share their meal with their classmates. Afterward, the students had their first Spanish lesson about “El Cuerpo” (the Body). The students could hardly wait to learn the new vocabulary. Here are some of the new words they learned! 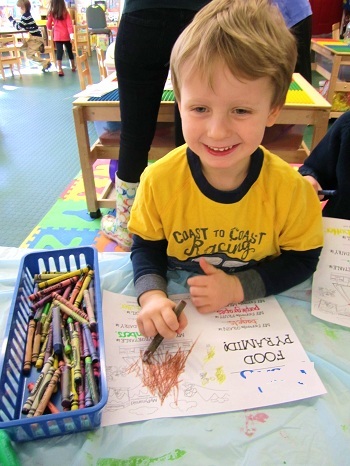 The nutrition fun continued on Thursday as the students revisited the NEW Food Pyramid. Contrary to the food pyramid that the teachers (and parents) grew up following, the NEW Food Pyramid was designed to promote a more balanced intake of the foods (with less emphasis on starches and sugars) and also to incorporate exercise. The NEW Food Pyramid also is more easily personalized to fit an individual’s dietary needs. 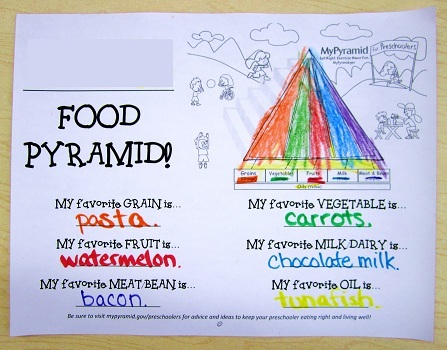 The students familiarized themselves with the NEW Food Pyramid by coloring it in and also selecting their favorite food choice from each group. Whether drawing from their memory or selecting from a basket, the students came up with some great answers! 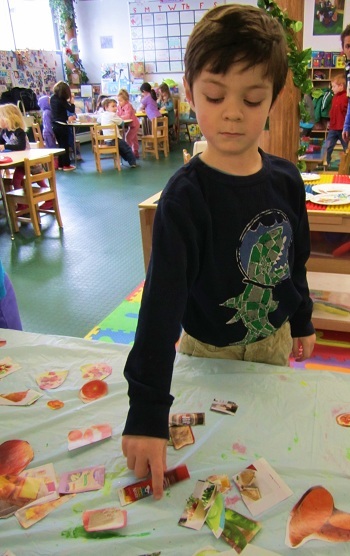 Can you guess which food group the student below was selecting his favorite from? Here is what the completed project looked like. The students wrapped up the week on Friday by volunteering their time for a great cause! A mommy of one of the students informed PPA that her office, Empire Reality, would be hosting a special Valentine’s Day Brunch for Seniors in Hoboken over the weekend. 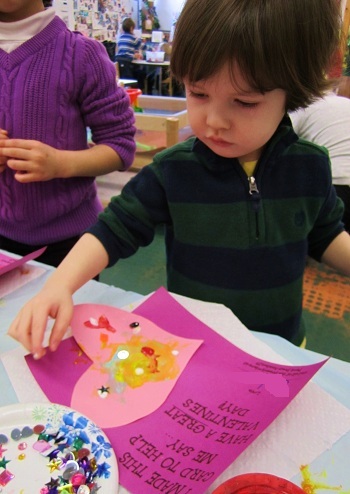 The thoughtful Mommy informed the teachers that the only thing missing from the brunch was some special valentines. Always willing to help out, the students were more than excited to get to work creating some very sweet and special valentines! Here they are in action! 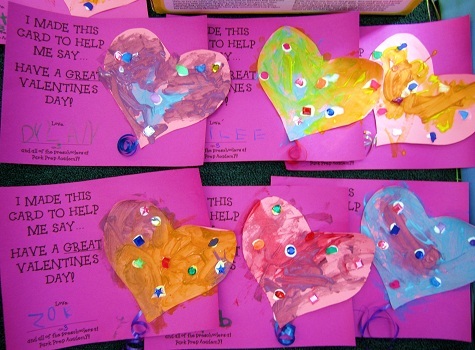 What beautiful valentines the students created! The teachers were sure that the seniors who will receive the valentines will love them! Be sure to check next week’s blog for photos from the brunch! 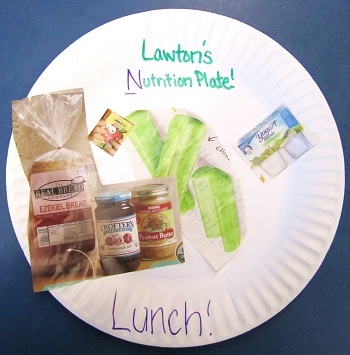 Friday afternoon rounded out Letter N is for Nutrition Week with a fun nutrition-themed technology presentation! First, the students played the interactive game of “Which Group is It?” where they had to identify the food and determine which food group it was a part of. After a week of practicing and studying good nutrition, the students aced pretty much every question – well, excluding tomato, that is a tricky one! To help motivate the students to put this nutrition knowledge to good use, the teachers selected some really fun clips of kids helping out in the kitchen! The following clip has a very helpful food chant that surely can help build some excitement about eating right at home! Be sure to test out the food chant and let us know how it turns out! Before the end of the presentation, the teachers discussed a particular food type that was left out of many discussion this week – sweets. Now, who would be better to discuss sweets than Cookie Monster himself? Watch below to see the super silly Sesame Street clip with BREAKING NEWS! Well, that is all for “Letter N is for Nutrition Week”. As always, thank you for reading. Have a wonderful and safe weekend! ALL RE-ENROLLMENT CONTRACTS AND DEPOSITS FOR THE 2011-2012 SCHOOL YEAR MUST BE SUBMITTED BY WEDNESDAY, FEBRUARY 16th. On Friday (2/18) of next week we will say “See you Soon!” to our beloved Spanish teacher, Miss Saily. Miss Saily will begin her maternity leave as she awaits the arrival of her second daughter, Kelly! We wish Miss Saily a very successful delivery. We all simply cannot wait to meet her! Stay tuned for updates soon!